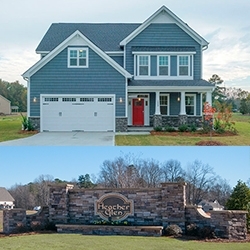 Raleigh, NC, November 28, 2017 --(PR.com)-- McKee Homes has announced the grand opening of their new model home in Heather Glen located in Raleigh, NC off Jordan Road near Ten-Ten Road, just minutes from Lake Benson in Garner. The grand opening event will take place at the newly built model home in Heather Glen at 1000 Sky Wave Trail, Raleigh, NC 27603. The event will be held from 12-2 PM on December 5 and will include food, cocktails, door prizes and giveaways. “This is a great opportunity to come visit Heather Glen and see homes under construction by McKee Homes as well as our newly finished model home,” said Carolanne Savio, McKee Homes New Homes Sales Consultant. Heather Glen offers a quiet country setting just 12 miles south of downtown Raleigh with all it has to offer for the best of both worlds. With large lots and a variety of floor plans to choose from, Heather Glen is an ideal neighborhood for families and move-up buyers. The beautiful new homes in Heather Glen are from McKee Homes’ Craftsman Collection and range from 2,200 to 3,600 sq. ft. with prices starting in the low $300’s. Each home features a designer kitchen with tiered cabinets with crown molding, granite countertops, under-cabinet lighting and stainless-steel appliances. A large master suite has trey ceilings, a walk-in closet, garden tub and separate shower. Heather Glen is not far from White Deer Park and Lake Benson Park - more than 150 acres combined, with trails, playground, arboretum, and nature center. Garner has a hometown feel, yet it’s only 10 minutes from downtown Raleigh. Since its inception, McKee Homes has done more than build quality new homes at competitive prices. They give homebuyers the freedom to personalize their homes with custom options and special features to get the new home they truly desire. McKee Homes is one of the fastest growing new home builders in Eastern North Carolina with new homes located in some of the area’s most desirable neighborhoods, offering comfort and convenience only a short drive from the Fort Bragg, Pinehurst, Raleigh and Wilmington Metro Areas. For more information, visit http://www.mckeehomesnc.com or call 910-672-7296.